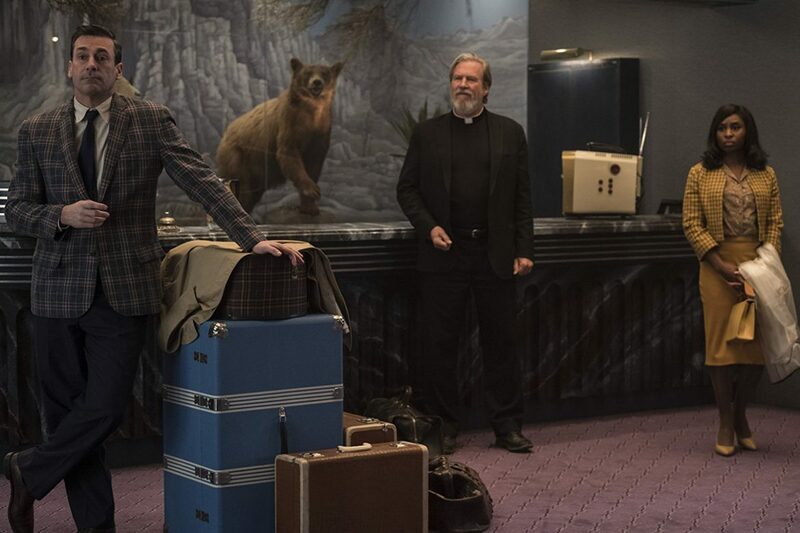 Overly clever to the point of frustration, Drew Goddard’s ensemble “Bad Times at the El Royale” keeps you lightly entertained. 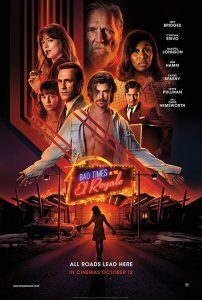 Featuring an eclectic collection of contrary characters, played by an equally diverse group of talented actors, “Bad Times at the El Royale” revels in coincidence. It feels very much like a bad joke when a priest, an African-American singer, a hippie, and a vacuum cleaner salesman arrive at a desolated hotel that straddles the state line between California and Nevada. At the El Royale, you can chose to stay in one state or the other. And in the main building, there’s gambling on one side and alcohol on the other, or something like that. One side charges a few dollars more for the room, as well, even though there isn’t any real difference. 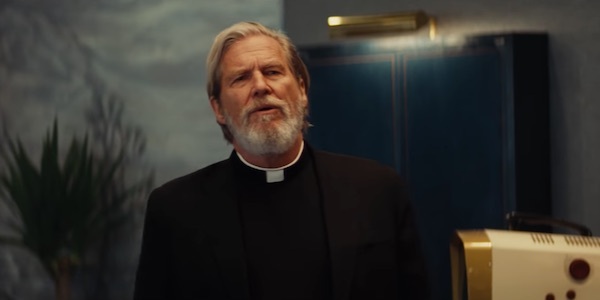 The priest Father Flynn (Jeff Bridges) is a curious older gentlemen, who is particularly interested in getting a specific room. The salesman named Laramie Seymore Sullivan (Jon Hamm) has already called dibs on the honeymoon suite. And the singer just wants a room as far away from everyone as possible. The timid hotel clerk named Miles (Lewis Pullman) is a nice kid, but he definitely doesn’t want visitors. The El Royale isn’t the most hospitable place to stay, even though it may have once been inhabited by some high rollers. And the secrets that the isolated establishment keeps might be sinister. Naturally, each one of the tenants have a story to tell. Goddard’s often funny script jumps around in time to give us a brief glimpse into what happened that led these fellow travelers to the hotel. And for a while the constant back and forth is entertaining. But the problem is that each segment has diminishing returns. Just as your foot gets tapping to the pace of the flashback, it ends, often unceremoniously with an ever growing level of ambiguity. And that toe-tapping is critical to the musical rhythm that informs on the narrative’s structure. Given how jam-packed the movie is with 1960s pop tunes, I found it impossible to focus on the song lyrics and their importance to the story. If the ultimate reveal or payoff was tremendous, I might consider revisiting the film in an effort to pick up on the subtext that is suggested by the collection of music. 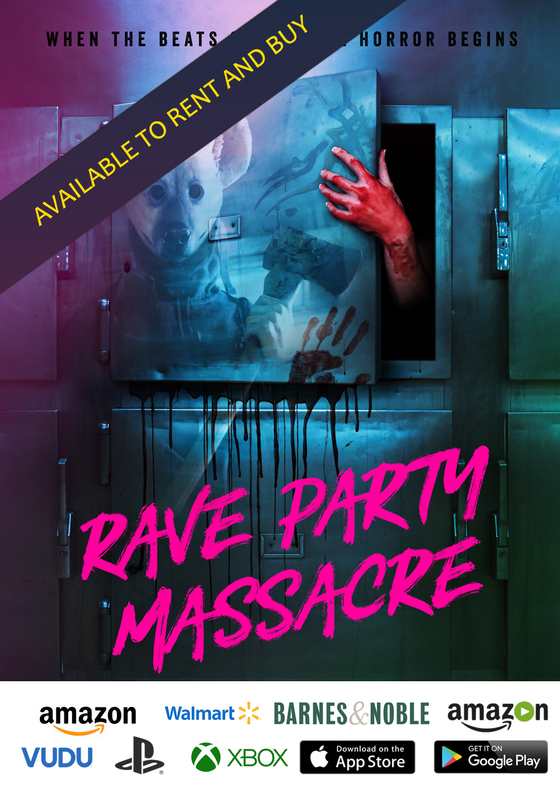 But, in just one sitting, I found myself focused on the characters and their individual significance, which clouded out the jukebox soundtrack. But that’s not to say that watching “Bad Times” isn’t a fun experience. Some viewers might be captivated by the complex construction that Goddard has attempted. And more than one backstory is, at least, intriguing enough to keep you engaged. For example, Chris Hemsworth in all his shirtless glory, plays a cult leader named Billy Lee. His early scenes are frightening. Billy Lee is clearly built upon Charles Manson, and Hemsworth has great fun with the role. But even though Goddard has introduced a charismatic character, possessed by an equally charismatic movie star, he doesn’t really know what to do with him as the film concludes. It’s all a bit of letdown. Two other characters are great, however. 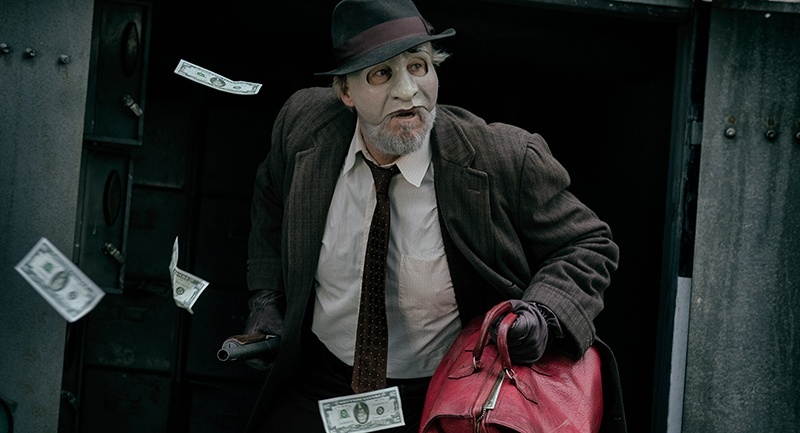 Jeff Bridges is the mercurial Father Daniel Flynn and relative film new-comer Cynthia Erivo plays singer Darlene Sweet. Bridges is able to balance the insanity of much of what transpires with a sincere, concentrated performance, which ranks as his best work since “Hell or High Water.” He and Erivo are the emotional center of the film. And the Tony award winning Erivo has a couple musical performances that are show-stoppers. What became obvious, however, was that either of these two tales could have been their own stand-alone film. And given the weight of these character’s stories, Goddard’s tricked up script actually undercuts the dramatic pathos introduced. “Bad Times at the El Royale” is a high concept mashup of ideas and story threads some of which work extremely well, and others that are merely perfunctory. It’s fun, but with little lasting impact. 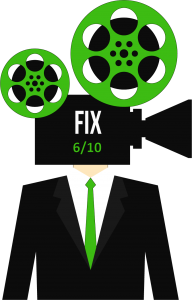 This is unfortunate given the talent involved and the expectations of fans of writer-director Drew Goddard.